Our Processing section is well equipped with the latest technologies to complement the manufacturing process. Though all process religiously follows the instruction mentioned in ancient manuscripts, the incorporation of modern technologies enables us to enhance production capacity and retains the purity of the herbs and plants used, without compromising quality. 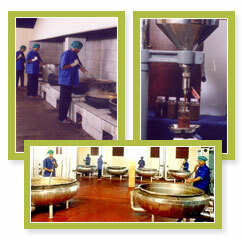 Every process is carried out as per the Good Manufacturing Practice (G.M.P.) guidelines specified by W.H.O. and QMS as per ISO 9001:2000 standards.